Cloud Cap Inn was built in 1889 on the northeast shoulder of Mt Hood at the 6000 ft mark, and is the second oldest building in the country maintained by the Forest Service. (The oldest is Grey Towers outside Milford, Pa., the boyhood home of the first national forest chief, Gifford Pinchot, which was built in 1886). Cloud Cap Inn was accessible back then from nearby Hood River via train, and then a long stagecoach ride up the side of the mountain. The excursion took 8 hours, which by car takes less than an hour these days. The Inn officially opened on Aug 3rd of that year, and was only allowed to operate 5 years during winter seasons due to the snowfall in the area, which sometimes exceeds 60 feet of accumulation. 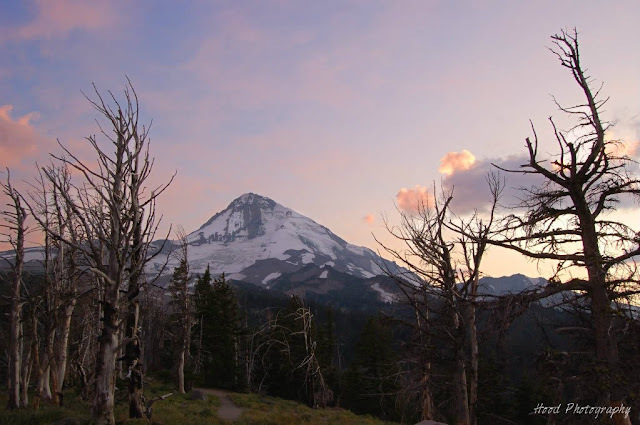 Cloud Cap remained the main destination on the mountain until Timberline Lodge opened on the south side in 1937. Operating in spring and summer only, Cloud Cap Inn ran on and off until 1946. There was threat of tearing the building down in the 50's, but a Mt Hood based climbing club, the Crag Rats, saved the building and are taking care of it to this day. In 1974, it was placed on Oregon's list of historical places. I'd never heard of this place before! Have you stayed there or is it a day lodge for hikers? I guess you heard that they found a previously unknown fault line running from Hood to the Columbia. What a lovely place but with all the trees already burned, what is there left for a fire to get a hold in?